Grill up a 1.5-lb piece of top sirloin or flank steak to medium rare. Let the steak rest, covered, while you work on the vegetables and seasonings. Cut one medium Granny Smith apple and 1/2 a medium red bell pepper (I used two small red peppers here) into matchsticks. 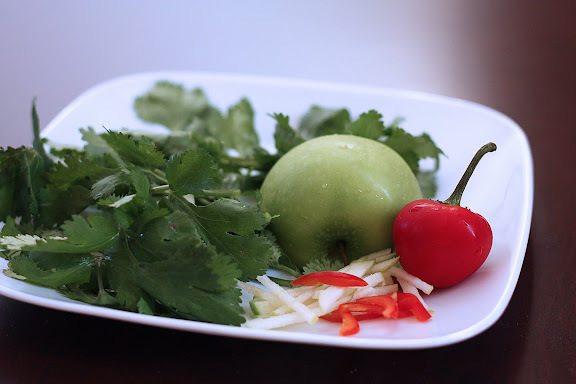 Toss the apple matchsticks with fresh lime juice to keep them from browning. Thinly slice half a medium red onion or two small shallots; set aside. Look into your vegetable drawer to see what Asian-ish fresh leafy herbs you have. Cilantro works. So does mint. Culantro would be terrific in this salad. Basil, perhaps? And if you have an old stalk of lemongrass at the bottom of the drawer, take it out and strip off the outer leaves and very thinly slice it crosswise from the bottom up until you almost hit the light-green part (approximately 2-3 inches from the bottom) and throw those into the salad. Any combination of the aforementioned herbs will work as well. Slice the grilled steak thinly across the grain and put the beef slices in a large mixing bowl. Add the remaining ingredients to the bowl. 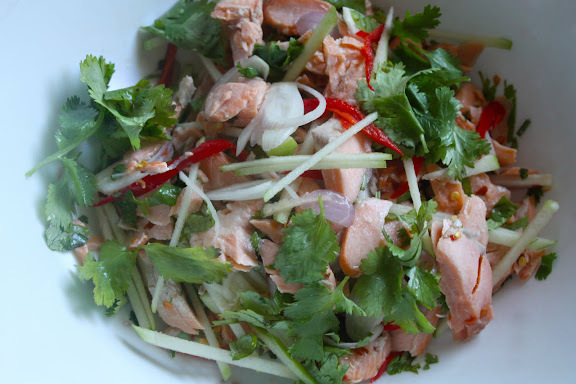 Season to taste with (ahem, Thai) fish sauce and fresh lime juice. If you like some heat, some thinly sliced fresh bird’s eye chillies or dried red pepper flakes can also be added to the salad. Sometimes, I throw in some roasted peanuts, but that’s optional. Serve immediately. This portion is enough to serve 4 people. Added 10-25-10: You can also substitute the beef with grilled or pan-seared salmon. That looks just perfect to me! Also, the photos are phenominal! 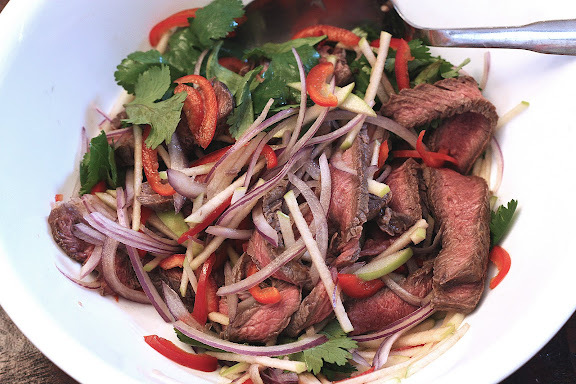 I love steak and apple, as it happens, and the lemongrass is making my mouth water. YUM! The apple is such a great idea in this salad! Sounds fresh and fabulous. I could go for some beef salad. Yum!!! Love it!! All beef, no lettuce! Yum…that’s a good salad. The cilantro is nice with beef too. Cilantro is one of those herbs that one should not live without! What a delightful salad! Apples are so nice here and I love the addition of peanuts too! this beef is cooked so nice – it must be perfectly cooked beef day! This looks amazing for a lazy day meal. This salad sounds so refreshing, and after the fantastic Chinese sausage, cucumber combo you introduced us to a while back, I’ll gladly leave myself in your capable hands. 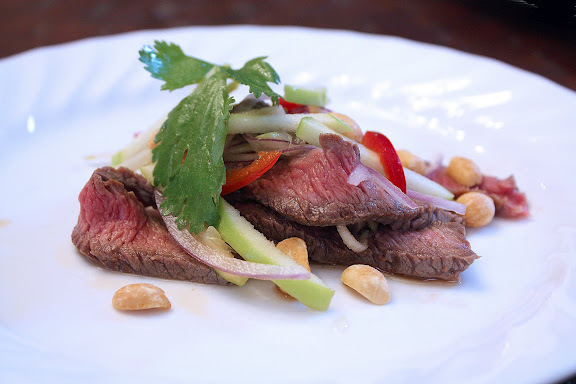 I love the beef and apple combo and am having fun imagining what the flavor changes would be with the Cilantro and lemongrass. Can’t wait to give it a try. That does sound good and easy enough for a lazy Sunday afternoon. I love the colors and flavors of the salad. Whenever I have a good steak to do what I wish with, I seem to always forget about the salad route. I need to combine those two more often. perfection. love the ingredients, and love anything with what i have always thought of as dipping sauce. but why not a sauce over beef and apple?